The Javan Rhinoceros (Rhino) is one of the most endangered animals in the world. In fact there are probably less than fifty left in the world. On this page of Interesting Animal Facts we will list numerous facts about these animals. You will find information about where they live, how they reached the brink of extinction, and what actions are being taken to protect them. This information is written for both kids and adults. Click here for a great selection of Amazon.com books about endangered animals. 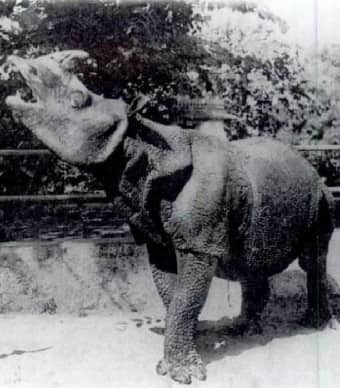 The scientific name for the Javan Rhinoceros is Rhinoceros sondaicus. Out of the thousands of Javan Rhinos that once roamed the rainforest of the earth only a handful are left; perhaps forty or fifty. The exact number is not known because they roam free in the rainforest of the huge Ujung Kulon National Park in Java Indonesia. People kill Rhinos for their horns. The horns are sold on the black market for use as decorations or for medicinal purposes. Poaching and the encroachment of people into their habitats are the main reasons the Javan Rhino is endangered. Their numbers have dropped drastically since the 1700's. At one point there were rewards given out by the government for killing these rhinos who caused sever crop damages. There are several conservation groups, including The World Wildlife Fund and the Defenders of Wildlife, who are trying to prevent these amazing animals from becoming extinct. They are protecting them from poachers, providing the correct food for them, and trying to promote breeding among unrelated members of the species. What is the fate of the Javan Rhino? This is still to be determined. There are dedicated conservationists and scientist who are doing their best to bring this amazing animal back from the brink of extinction. However, there are so few left that finding unrelated mates is a difficult task. When looking at the success in saving other types of Rhinos there is hope for the Javan Rhinos. At one point there were only about four White Rhinos left in the wild and now there are thousands. Conservation efforts to save the Indian Rhinos were also a great success, with less than forty at one point there are now thousands. Hopefully this animal will be saved and remain on the earth for future generations to see and be amazed at.